A spot in the FIFA U-17 World Cup would be the ultimate reward for the hard work PNG U-17 coach Harrison Kamake and his squad have put in since November last year. Papua New Guinea enters their seventh OFC U-17 Championship with qualification for the FIFA U-17 World Cup in India in October this year. Kamake said, his team began training in November 2016 in preparation for the OFC U-17 Men’s Championship and their objective for this tournament is to reach the final. The PNG U-17 team arrives in Auckland on 19 January ahead of the OFC U-17Men’s Championship for few lead-up matches against New Zealand U17 national team and Fiji U17 national team. ‘’So far I am happy with the way our preparation has been going and with the few lead-up matches in New Zealand will be helpful for us to see where our strength are as a team.” Kamake says. Papua New Guinea share Group A with New Caledonia, Tahiti and Vanuatu, all of whom are serious contenders in the race to India. 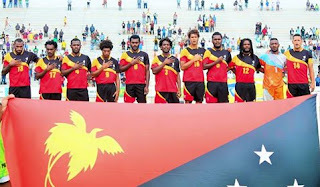 Papua New Guineaplays their first game against New Caledonia on the 11 February and Kamake knows how important the first game is to start the competition. ‘’We have respect for all our opponents. They are all good teams. The first game against New Caledonia will be the hardest but we have to fight for every point.” said Kamake. The PNG U-17 squad are: Alben Pukue, Abraham Allen, Barthy Kerobin, Charley Ningikau, Dunstan Jamua Jeffrey, Dopson Noi, Emmanuel Simongi, Emmanuel Yopiyopi, Freeman Giwi, Graham Berigami, Jonathan Allen, Kimson Kapai, Milton Karu Biwa, Oberth Boram Simon, Ricky Clyde Wadunah, Samuel Jeremiah Detnom, Sylvester Wafihunia Luke, Thomas Kongragle, Wolfram Kob Gregory and Yagi Yasasa.